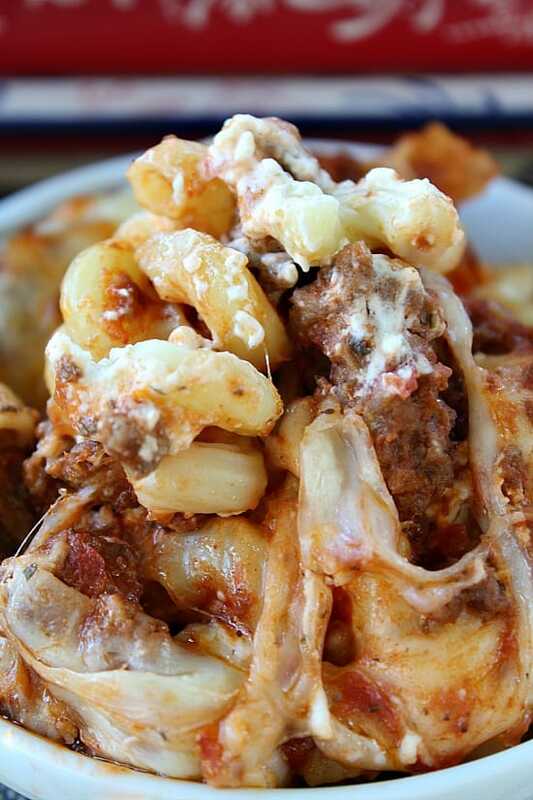 This million dollar pasta bake is definitely comfort food at its best. I’m such a sucker for pasta and could eat it everyday. 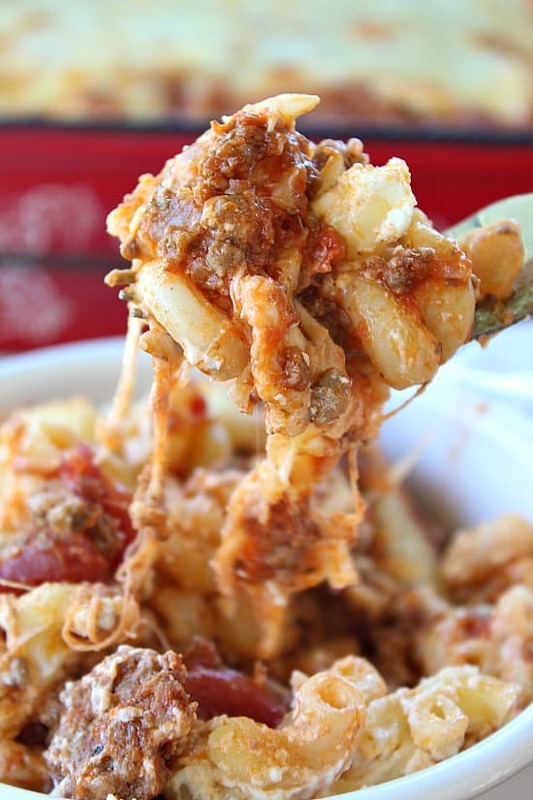 This cheesy pasta bake recipe is to die for. It’s creamy, cheesy and so tasty! The cream cheese added in this recipe makes the flavor of this dish amazing. Kind of reminds me of lasagna recipe. And that is one of my all time favorite pasta dishes. 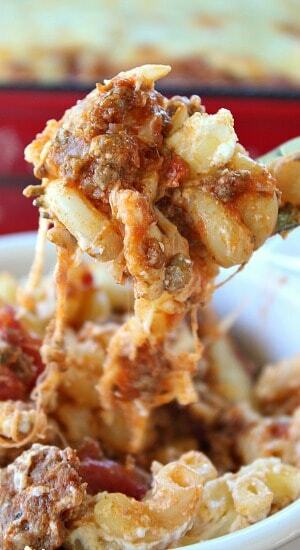 You can also add some hot Italian sausage, along with the ground beef, for a delicious mix of flavors. Who doesn’t love Italian sausage? You could even make this with only the sausage. That’d be amazing. I’ll have to do that next time. YUM. Just look at that cheese. So delicious. Packed full of flavor, cheesy delicious flavor. I had posted a recipe for Million Dollar Spaghetti on my Facebook page but the recipe was never found. 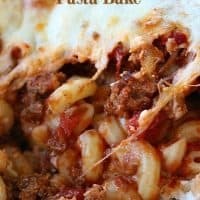 I searched Pinterest and found a delicious recipe from Sugarapron.com for the million dollar spaghetti which sounded delicious. 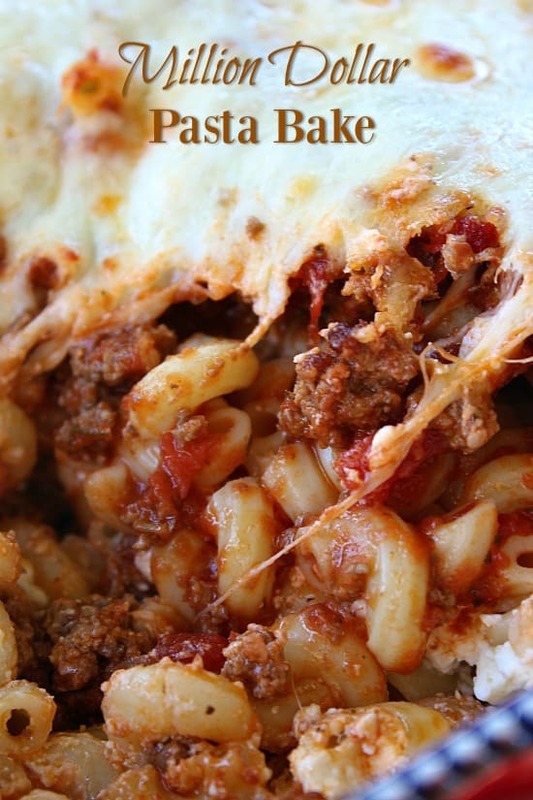 I tweaked the recipe a bit and this is what I came up with, a delicious million dollar pasta bake. Make sure to check out Sugar Apron’s other recipes while you’re there. They all look amazing. 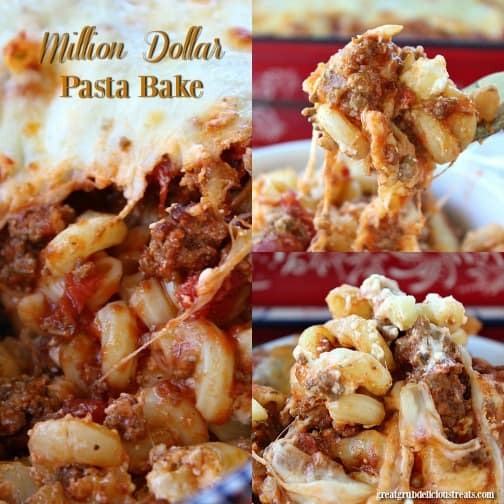 Make this delicious million dollar pasta bake the next time you are craving comfort food. It’s SO good! In a large skillet, add oil and heat over medium heat. Saute onions and garlic for about 4-5 minutes. Crumble in ground beef, salt and pepper and cook until done. Drain grease and return to pan. Pour spaghetti sauce over meat and stir until well combined. Cook pasta according to package directions until pasta is "al dente"
In a medium mixing bowl, stir cream cheese, sour cream and cottage cheese until well combined. Set aside. In a 9 x 13 baking dish, add 1/2 of the butter, sliced, to the bottom of the baking dish. Spoon half the pasta into the dish. Add the cream cheese mixture and smooth over the top of the pasta. Spoon remaining pasta over cream cheese mixture. Add the remaining butter to the top of the pasta. 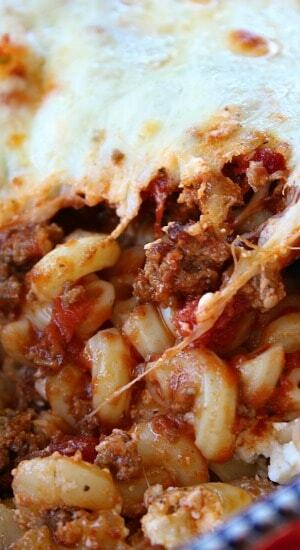 Cover pasta with meat mixture. Remove from oven and cover with mozzarella cheese. Return to oven and cook uncovered for an additional 20 minutes or until pasta bake is bubbling and cheese has started to brown. This recipe was really good. The only thing ill add is adding the meat mixture twice. can u make this in a crockpot? I made MDPB for company this weekend and served it with a salad and garlic bread. It was such a hit that they asked me if we could warm up the leftovers and have for dinner the next night. I did what my guests wanted and it was even better the second night. MDPB is a winner!